This, friends, is what I’m talking about. 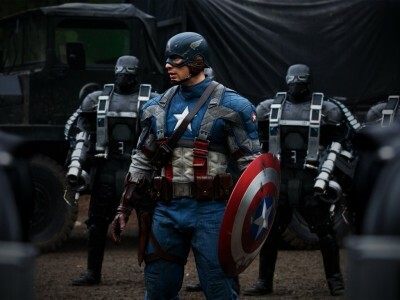 Captain America: The First Avenger is a work of pure pop bubblegum pleasure—a rousing, thrilling, and thoroughly satisfying summer blockbuster that puts most of its multiplex-mates to shame. The filmmakers responsible—director Joe Johnston, screenwriters Christopher Markus and Stephen McFeely, producers Kevin Feige and Amir Madani—understand that “popcorn movie” doesn’t have to be a term synonymous with brain damage; they get that they can offer up a good time without openly insulting a moviegoer’s intelligence. The result is an absolute treat. The parody movie has become so corrupted by the evils of various Wayanses and their demon spawn, Friedberg and Seltzer, that I think most of us had basically given up on the form; we’d always have our fond memories of Mel Brooks, Monty Python, Carl Reiner, and Zucker-Abrams-Zucker, but Hollywood doesn’t aim that high any more. Imagine my surprise to find that a couple of Irishmen went off and made the best spoof comedy in a good twenty years. Zonad isn’t exactly a parody of anything in particular—it opens with the heroic music and deep-voiced intro of a superhero movie (“Earth… center of the known universe”), and its protagonist dresses the part. But the film is more of a sci-fi comedy, with broad jabs at provincial life thrown in. The target doesn’t really matter anyway; what Zonad captures is the free-wheeling spirit of those Brooks and Z-A-Z movies, where anything goes, and no laugh was too cheap to lunge for. The opening line of Otto Preminger’s 1968 film Skidoo is “Harry, no, I don’t wanna see that!”—a response that greeted the film upon its initial release, and frequently since. 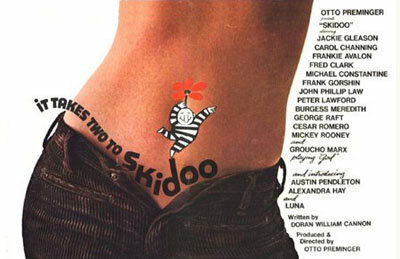 One of the most notorious boondoggles of the late 1960s—a period in which the Hollywood studios weren’t exactly creating their most enduring works—Skidoo was an all-star disaster, so poorly received and legendary in its badness that this 2011 DVD is its first official home video release. Cult movie (and bad movie) aficionados had to make do with its occasional airings on pay cable; it was most recently sighted as part of TCM’s late-night “underground” series. So, after all this time, how is the movie? I’m not gonna lie to you: it’s pretty rotten. But it’s not boring—like Myra Breckenridge or Southland Tales, Skidoo is so spectacularly ill-conceived and so far removed from anything resembling either art or reality that it is perversely, yet undeniably, entertaining.